SRINAGAR: Barring the BJP, all parties in Jammu and Kashmir have opposed the declaration of the Amarnath cave shrine as “silence zone” by the National Green Tribunal (NGT). 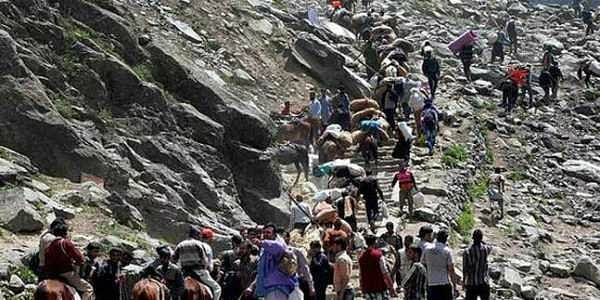 The NGT has on Thursday clarified that there was no ban on chanting of mantras and singing of bhajans inside the Amarnath cave shrine. It, however, the devotees or any individual visiting the shrine should maintain silence while standing in front of the ‘Amarnath Maha Shivling’, a natural formation of ice inside in the cave. The clarification has not gone down well with the state’s main Opposition party, the National Conference, while the BJP said that the decision was taken in the interest of preserving ecological balance. BJP spokesman Arun Gupta told The New Indian Express that NGT announced its decisions after taking into consideration the ecology of the area. “We have to balance religious sentiments and other issues. If we think any of our actions has an adverse impact on ecology, then we should not hesitate from taking decisions that seek to strike a balance,” he said. “We should look into the positive aspect of this decision and adhere by it. We should not play politics on every issue. We should not give the issue a religious colour,” Gupta said. A Congress leader also expressed dismay over the NGT order. “It has hurt the religious sentiments of devotees. The state and the Central governments have failed to project the true situation before the NGT,” he said and urged the NGT to reconsider its order. The Shiv Sena also condemned the NGT order, saying that instead of providing more facilities to the pilgrims, the NGT has ordered ban on religious rituals. Party spokesperson Dimpy Kohli appealed to the central government not to hurt the religious sentiments of Hindus and sought withdrawal of the NGT order.